The decision is pivotal because it could expose McDonald's Corp. to liability for management practices in those locations. It also comes as protests for higher pay have captured national attention, with labor groups calling for pay of $15 an hour and the right to unionize. FILE - This Oct. 17, 2011 file photo, cars move through the drive-thru window at a McDonald's in Springfield, Ill.
NEW YORK (AP) — McDonald's is coming under intensifying pressure for labor practices at its U.S. restaurants. The National Labor Relations Board said Tuesday that the world's biggest hamburger chain could be named as a joint employer in several complaints regarding worker rights at franchise-owned restaurants. The decision is pivotal because it could expose McDonald's Corp. to liability for management practices in those locations. It also comes as protests for higher pay have captured national attention, with labor groups calling for pay of $15 an hour and the right to unionize. Organizers had been pushing to get McDonald's named as a joint employer at franchised restaurants, a move intended to give them a centralized and powerful target. In the U.S., the vast majority of McDonald's more than 14,000 restaurants are owned and operated by franchisees. The same is true for many other fast-food chains, including Burger King and Yum Brands, which owns Taco Bell, KFC and Pizza hut. As such, the companies have sought to distance themselves from the pay protests by saying they don't determine wages at its franchised locations. Heather Smedstad, senior vice president of human resources for McDonald's USA, said in a phone interview that the company has never been determined to be a joint employer in the past and that it would fight the decision by the labor board. "This is such a radical departure that it should be a concern to business men and women across the country," she said. Still, labor organizers say McDonald's should be held accountable because it has so much control in setting the terms for how its restaurants are run, including what menus, supplies, uniforms and training materials are used. "There's really no doubt who's in charge," said Micah Wissinger, an attorney who brought a case on behalf of McDonald's workers in New York City. In March, lawsuits on behalf of McDonald's workers in three states also detailed use of company software that monitors the ratio of labor costs as a percentage of sales at its restaurants. When that ratio climbs above a target, workers were forced to wait around before they could clock in, according to one of the suits. In a call arranged by labor organizers, longtime McDonald's worker Richard Eiker also recounted how McDonald's regularly sends representatives to check up on how franchisees are running restaurants, including by standing outside the drive-thru to time how quickly cars go through. "Managers go crazy when corporate comes in for these inspections," he said, adding that restaurants are constantly told to keep costs down. 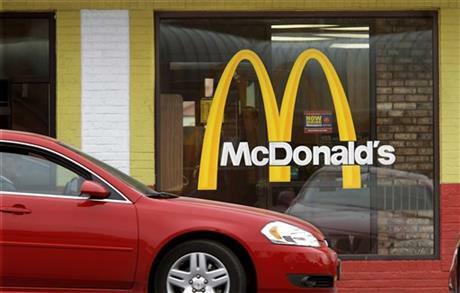 The National Labor Relations Board said 181 cases involving McDonald's have been filed since 2012. For the 43 cases that were found to have merit, the board said McDonald's or its franchisees will be named as respondents if the parties fail to reach a settlement. The other cases were found to have no merit or are still pending. The International Franchise Association, which represents franchisees, has opposed the identification of McDonald's as a joint employer. The group also recently filed a lawsuit in Seattle challenging whether fast-food franchisees should be treated like large employers, thus subjecting them to a new $15 minimum wage at an earlier date than smaller businesses.